“Dating Coach Flirt Expert” Michel Vincent has used his powerful psychological techniques to convince two women to stand somewhat close to him. His expression suggests he finds this distressing. Jeff Allen’s Australian visa may have been cancelled earlier this year, but his subscription to Dress Like a Human Op Shop Monthly was not. 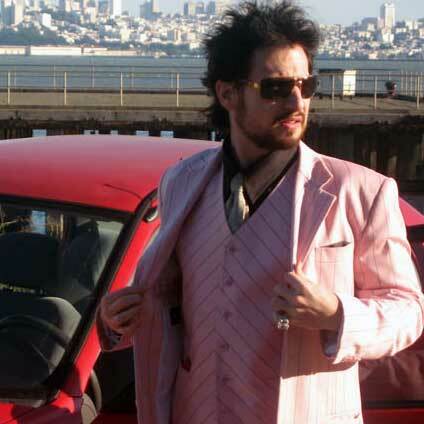 The cleverly nicknamed “Jeffy” is also standing near the fastest and sexiest kind of car - a red one. Good for him. Here’s Neil in a situation we can all relate to. Floating on his inflatable mattress, a beautiful blonde draped her legs awkwardly across him while feeling for his wallet. In a moment, Neil will realise that he’s lying fully clothed in the middle of a swimming pool, unable to stand up without getting drenched. And he will feel silly. a) a smoking hot promotional picture for pick-up artist Richard La Ruina, demonstrating the effectiveness of his effortless seduction techniques? b) the last known photograph of pick-up artist Richard La Ruina before three frighteningly expressionless models remove their skin-suits to reveal alien lizard creatures and consume his flesh? Okay, now we’re getting somewhere. David Tian has it all. Three women. Night-time sunglasses. A surprisingly cramped limousine. A wedding ring. An Asian Barbra Streisand. Wait, what? He’s married? What a beta loser. When a woman in her most expensive lingerie lies along the back of your designer couch, what do you do? If you’re Zan Perrion, you use her as a headrest while you watch the game. Carry on staring at the back wall, woman. At first, Mystery seems to be playing the sexual equivalent of that game where someone sticks their arms through your armpits and pretends their hands are yours then does something messy like feed you spaghetti. But on closer examination, there is absolutely no sign that there is an actual woman attached to those legs. Instead, Mystery seems to be taking “peacocking” to a new level by wearing a pair of severed legs around his waist. It’s this kind of imagination that makes Mystery so irresistible. 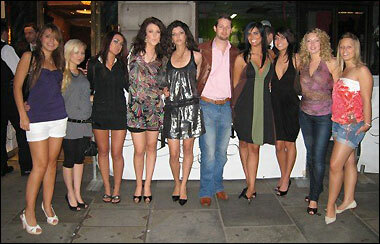 This photo shows Adam Lyons taking nine different women on the same date at the same time. It seems unlikely that Lyons began the night with so many datees (since I doubt he drives a minibus), so assuming he started with four, his harem has increased by a factor of 2.25 in one night. At this rate, within one month Lyons will be dating 36 billion women, meaning a typical dinner date will cost over $2.9 trillion. Now that’s commitment to your art.